SYRACUSE — An open house will be held at the new Syracuse Elementary School, 12877 N. Kern Road, from 2 to 4 p.m. Sunday, Sept. 10. It will begin with a grand opening ceremony involving several VIPs, followed by cake, drinks and giveaways. Student-guided tours will allow members of the community and surrounding communities to access the entire building measuring at more than 100,000 square-feet. The new building was built with collaboration and learning through the use of technology in mind. 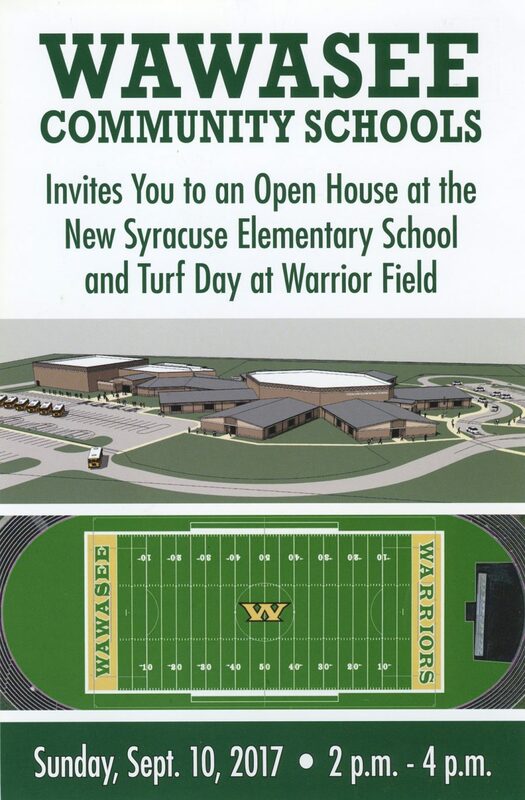 In conjunction with the open house, the new artificial turf Warrior Field at Wawasee High School will be open to the public, also from 2 to 4 p.m. Anyone coming to the field will be able to walk on it, kick a soccer ball or toss a football. Warrior Field is the only Northern Lakes Conference field hosting men’s and women’s soccer games in addition to football. Warrior Radio WRWT 93.7 FM will emcee Turf Day with T-shirts, soccer balls and football giveaways. The open house at Syracuse Elementary will take place rain or shine, but Turf Day is dependent on the weather cooperating.